The Princess of Asturias Award from the past year has been awarded to two researchers, E. Charpentier and J. Doudna, for their work around the biotechnology technique called CRISPR-CAS, making it possible to edit the genome of living beings. But, what is it? why does it have this complex name? Above all, what are the changes that have occurred and are occurring in this technique in order to use it as “molecular scissors” and beyond and that have made it, according to many opinions, the most promising biotech technique of the 21st Century? This system is present in bacteria and archaea (these organisms use it as a defense mechanism against virus attacks). The system is based on the existence in bacterial genomes of one or more regions first constituted by a series of repetitions of short DNA sequences (of no more than 30 pairs) of bases which are also palindromic, i.e. they have the same nucleotide base in both directions of the DNA. Secondly, there are other DNA fragments between said repetitions that have a viral rather than a bacterial origin. Therefore, these regions are called CRISPR: Clustered Regularly Interspersed Short Palindromic Repeats. Finally, in the vicinity of CRISPR regions there are a number of genes from which enzymes that cut DNA are synthesized, although they need the cooperation of RNA, originating from such CRISPR regions, to do this. It is for this reason that these genes are called CAS-Crispr ASsociated. This whole system provides bacteria with a defense system against a virus attack that works in two steps. First, by being invaded by a virus for the first time, the bacteria synthesize the CAS enzymes that cut the DNA of such infectious agents into fragments and introduce them between short repeated sequences. For this last step, enzymatic DNA repair systems that are normally present in bacteria are also used. “Armed” in this way, when bacteria undergo a new infection with a virus whose DNA is present in part in the CRISPR region, in addition to the CAS enzymes, an RNA fragment is synthesized with the genetic information of the virus. This RNA binds to the CAS enzymes and they stick together first due to the complementarity of the RNA nucleotide sequence on the DNA of the infectious agent. They then cut and destroy it through the action of CAS enzymes. In short, this is an immune system acquired from bacteria. However, this ancient system of exclusive immunity of bacteria has been modified so that it can act with biotechnological purposes in cells, and even in eukaryotic organisms (including humans themselves) in which it is not naturally present. Specifically, what has been done in such cases is to introduce CAS bacterial enzymes into eukaryotes but instead of being linked to RNA virus fragments, they are linked to RNA fragments with sequences complementary to the gene or genes that are intended to be manipulated. These artificial constructs act on eukaryotic genes by initially cutting them and then allowing them to be replaced with others of interest. The enzymes that also exist in eukaryotic cells for DNA repair get involved again here. Something has therefore been achieved that has been long sought after without much success: editing the eukaryotic genome. The application of this technology has opened up interesting prospects in various fields, ranging from basic research to medicine, through agriculture and livestock. In fact, the possibility of using this technology to cure a muscular degenerative disease in living organisms (mice), beyond cell cultures or in vitro, has been demonstrated recently. The possibility of being able to edit the genome of embryos with genetic diseases has also arisen. 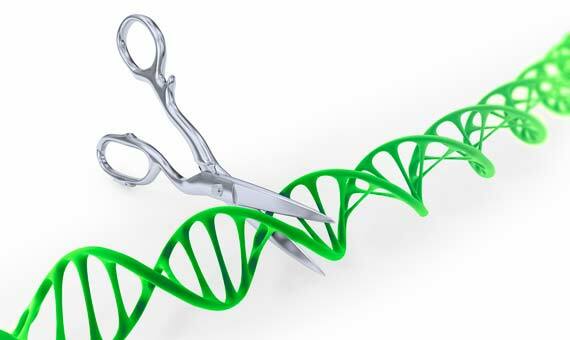 But possible editing of eukaryotic genomes and genes based on cutting and replacing led by the CRISPR-CAS system has the drawback that such changes are heritable and irreversible, which, especially in the case of embryos, has raised many ethical, biological and social debates. To avoid these problems, the first thing being done is deactivating the area of CAS enzymes that act by cutting the DNA, i.e. their action as molecular scissors is being removed. So-called dCAS (for deadCAS), or better said, “silenced CAS”, in terms of their DNA cutting function, thus appear; however, they retain their function to bind to the DNA. Instead of with RNA, these dCAS proteins are subsequently loaded with transcription or gene silencing factors, which are normally other proteins. In the end, what we have are biotechnological constructs that make it possible to enable or disable the genes of eukaryotic organisms or cells in a targeted manner without having to cut and remove them. Objectives can thus be achieved such as obtaining organisms of interest in agriculture and livestock, or curing diseases in humans. Once all these problems are solved so that these dCAS can effectively access eukaryotic genes (adenoviruses are now being used as vectors) and the target genes are activated or silenced stably, this modification of the CRISPR-CAS can become an even more powerful biotechnology tool than it is already for basic and applied research. Perhaps, all of this will also make it possible for researchers such as Charpentier and Doudna and/or others, besides being awarded the Princess of Asturias Award, to win the Nobel Prize, and remember that it was a Spanish scientist, Dr. Francisco M. Mojica from the University of Alicante, who discovered the CRISPR-CAS system  of bacteria on which all this story has been developed. Mojica et al. 1995. Long stretches of short tandem repeats…Mol Microbiol.17(1):85-93. The first time that Mojica et al. reveal the molecular basis of the CRISPR system. Mojica et al. 2000. Biological significance of regularly spaced repeats in the genomes of Archea, Bacteria and Mitochondria. Mol Microbiol. 36(1):244-6. Where the role of the system as a acquired immunity mechanism of bacteria is clarified. Lander E.S. 2016. The heroes of CRISPR.Cell 164(2): 18-28. Recently published in one of the most prestigious journals in the world and one of the most important American scientists undoubtedly recognizes Dr. Mojica’s role as a pioneer in this field. Eisen M. 2016. The villain of CRISPR. Posted in the Blog “IT is not Junk”. In this article, which was prompted by the above, doubts are cast on some of E. Lander’s findings on the “history” of discoveries around the CRISPR-CAS system. Nevertheless, Dr. Mojica’s role is never debated and it even explicitly talks about his nomination for the Nobel Prize. Is there Genetic Evidence of Climate Change?